Our family has a membership to the San Diego Zoo, and we hang out there (and at the San Diego Safari Park, also run by the zoo) quite a bit. Their newest attraction is an area called Africa Rocks, containing a number of animals native to Africa (including Madagascar). Among these are fossas (Cryptoprocta ferox), now enjoying a much larger home than their previous digs at the zoo. 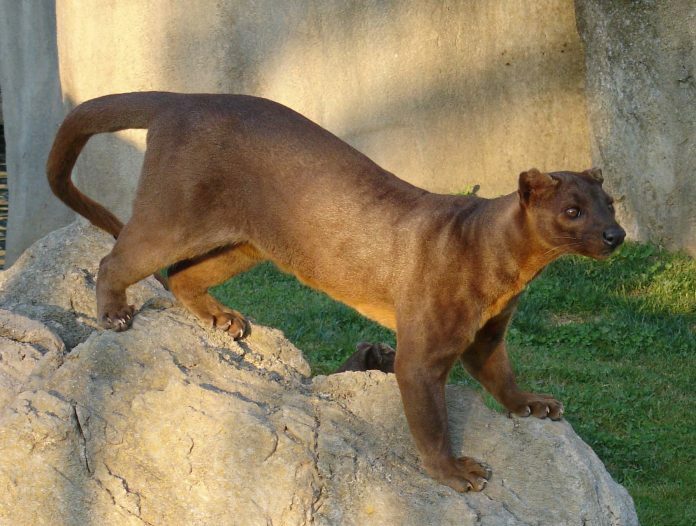 Everything about the fossa seems a bit off, starting with its name, which is usually pronounced “foosa.” The animal looks rather like a large cat but with the face of a dog, round ears, and an excessively long tail. But in fact it’s neither a dog nor a cat. It’s related to both the mongoose and the civet, and I find its appearance oddly unsettling, as if it can’t figure out what it wants to be. But this largely solitary animal, which lives in the forests of Madagascar, is at the top of the local food chain. It’s excellent at climbing trees, a good runner, and a skilled hunter (it likes to eat small animals, especially lemurs)—active both in the daytime and at night. The fossa is currently classified as “vulnerable.” Only about 2,500 remain in the wild; their numbers are decreasing due to habitat loss, disease, and humans who regard them as pests. Fossas are, however, thriving and breeding in captivity. You can learn more about the fossa in National Geographic.